This is the scene from my daughter Bella’s room. During the day, especially Saturday, the sound of children filling this little square/playground easily reaches our apartment, across the street, on the second floor. I’m happy to open the windows to hear their voices. 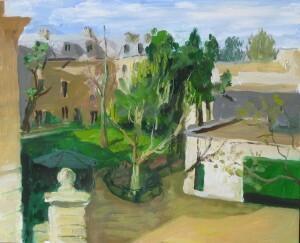 I painted this picture from my window, on one of the first of the really warm days of spring. A still cool morning, the children had not yet arrived. Meet some of our other neighbors. 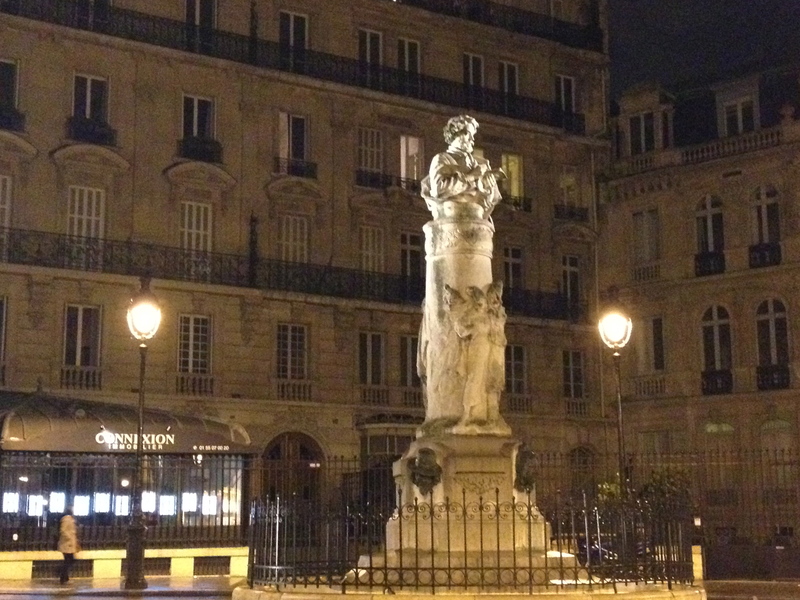 When we moved back to Paris from Saint Germain-en-laye last November 2012, I knew that we were moving back to a place full of history. As an artist I am especially aware of this. But I didn’t know the half of it. I would have felt a bit intimidated bringing my paints and easels to 34 rue Notre Dame de Lorette. I lean out my window and see Place St. George. 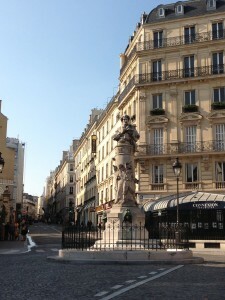 In the center of the Place is a statue of the caricaturist and printmaker, Paul Gavarni. He was said to have made many drawings of the girls of the neighborhood, or “Lorettes,” girls of easy virtue. Here he is depicted with a sketchbook in hand. The building on the right hand side is 28 Place St. George, once the home of Paul Gaugin. Here are more of Paul Gaugin’s paintings. 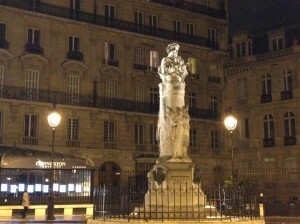 In the photo below, if you follow the street behind the statue, rue Notre Dame de Lorette, you arrive at number 58 on the left, where Eugene Delacroix had his studio between 1845 and 1857. This was a new neighborhood at that time, far removed from the center of Paris. Mr. Delacroix eventually moved his studio to Rue de Furstemburg in the 6th arrondissment to be closer to his friends. At night the park across the street is empty, the children asleep at home. On the sidewalk below, the sound of wheeled suitcases and revellers from the hotel next door reaches my window. I imagine that among the revelers walk the spirits of some of my neighbors past. I leave my windows open. If you want to find out more about the neighborhoods of Paris, I recommend a set of books called Around and About Paris, by Thirza Vallois, and Painters in Paris: A Street by Street Guide, by Frédéric Gaussen.